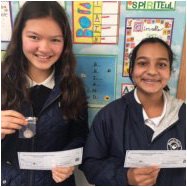 Over 200 students entered the American Association of Teachers of French (AATF) 2015 National French Essay Contest, and we were very pleased to learn that two of our middle school students won 1st and 2nd Place in this prestigious national contest! Well done, students! First Place: Olivia Ang-Olson, pictured left. Second Place: Adithi Benush , pictured right. Both received a monetary award, poster, and certificate, and Olivia received the 1st Place Medal.